Harvard physicists have shown that specially treated diamond coatings can keep water frozen at body temperature, a finding that may have applications in future medical implants. 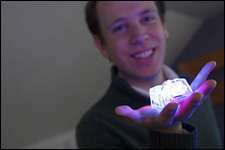 Doctoral student Alexander Wissner-Gross and Efthimios Kaxiras, physics professor and Gordon McKay Professor of Applied Physics, spent a year building and examining computer models that showed that a layer of diamond coated with sodium atoms will keep water frozen up to 108 degrees Fahrenheit. In ice, water molecules are arranged in a rigid framework that gives the substance its hardness. The process of melting is somewhat like a building falling down: pieces that had been arranged into a rigid structure move and flow against one another, becoming liquid water. The computer model shows that whenever a water molecule near the diamond-sodium surface starts to fall out of place, the surface stabilizes it and reassembles the crystalline ice structure. Simulations show that the process works only for layers of ice so thin they’re just a few molecules wide — three nanometers at room temperature and two nanometers at body temperature. A nanometer is a billionth of a meter. The layer should be thick enough to form a biologically compatible shield over the diamond surface and to make diamond coatings more useful in medical devices, Wissner-Gross said. The work is not the first showing that water can freeze at high temperatures. Dutch scientists had shown previously that ice can form at room temperature if placed between a tiny tungsten tip and a graphite surface. Kaxiras and Wissner-Gross’s work shows that ice can be maintained over a large area at body temperature and pressure. Device manufacturers have been considering using diamond coatings in medical implants because of their hardness. Concerns have been raised, however, because the coatings are difficult to get absolutely smooth, abrasion of the tissue surrounding the implant could result, and that diamond might have a higher chance of causing blood clots than other materials. Wissner-Gross said a two-nanometer layer of ice would just fill the pits in the diamond surface, smoothing it out and discouraging clotting proteins from attaching to the surface. “It should be just soft enough and water-friendly enough to smooth out diamond’s disadvantages,” Wissner-Gross said. Wissner-Gross and Kaxiras are planning experiments to confirm the computerized findings in the real world. Wissner-Gross said they expect results within a year. “We’re reasonably confident we’ll be able to realize the effect experimentally,” Wissner-Gross said. Wissner-Gross, who has been a doctoral student at Harvard since 2003, said the research grew out of an interest in the physical interaction of nanostructured surfaces with molecules that are biologically relevant, such as water. Diamond films are growing cheaper, Wissner-Gross said, and as their cost declines the array of possible uses of the material grows wider. The work has won Wissner-Gross the 2007 Dan David Prize Scholarship from Tel Aviv University and the 2007 Graduate Student Silver Award from the Materials Research Society. Wissner-Gross, who expects to graduate in June 2008, said he plans to continue work not only on this project, but on other efforts concerning the physics of surfaces that have novel properties.